Langton Associates was part of a multi-disciplinary team collaboration on the design of a 46 acre expansion of an existing historic cemetery. 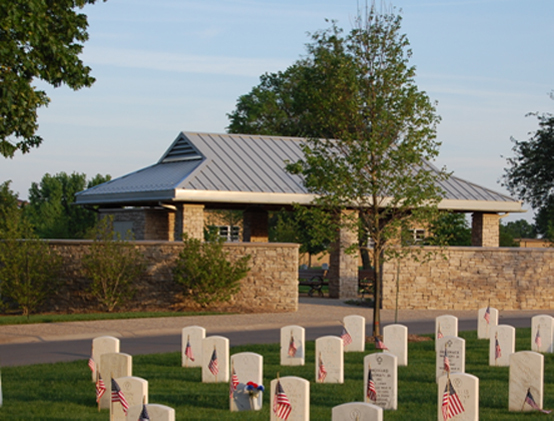 Work included 13,000 crypts, 4,500 Columbaria, 9 Committal Service Shelters, a Memorial Plaza, and Mississippi River Bluff Memorial Promenade. The Committal Service Shelter represents many green design principles. Traditional electric service to the site would have been too costly and required the destruction of grave sites. All power is supplied by roof mounted Solar Panels. The retaining walls/wind screen is constructed of Limestone which was quarried within 75 miles of the site. Missouri Limestone walls and caps are more durable and less porous than other Limestone. Cedar decking and composite structure which make up the wood structure are all recyclable. The paving is concrete with local Missouri Aggregate which is attractive, locally sourced and safe. 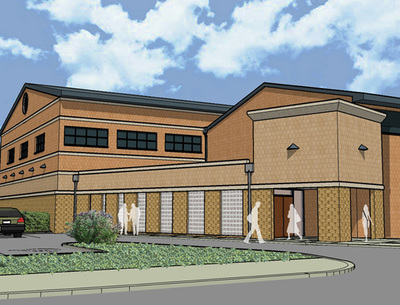 Langton Associates was the Architect of Record for the new construction of the 45,000 SF pre-engineered steel building financed through a bond issue approved by St. Peters voters. A 4.3-acre site of City of St. Peters property was selected. The design included 5,000 SF for offices, including training room, and parts storage; a 16,000 SF Fleet Maintenance work area with 8 working bays; and a 21,000 SF area for Solid Waste Operations and storage area for 32 vehicles; plus a wash bay with pressurized sprayers. Additionally, there is a 3,000 SF mezzanine storage area with an overhead crane. Backup generator for emergency HES operations was also part of the design criteria. $4.5 Million project. Restoration of the original Jefferson Barracks Red Cross Building to be used as a “Citizen Soldier” museum. Building #96 is a one-story brick building with a partial basement. This project received approval from the National Park Service and the State Historic Preservation Office. Funding is through Save America’s Treasures. Langton Associates assisted in the submittals for these applications. The renovation includes restoration of the exterior including removal of the wood ramp, which compromised the integrity of the original facade. The new ADA access is compatible with the landscaping and integrates with the building without compromising the historic character. The building is approximately 5,000 SF of display, conference room, museum, and office/work room space. 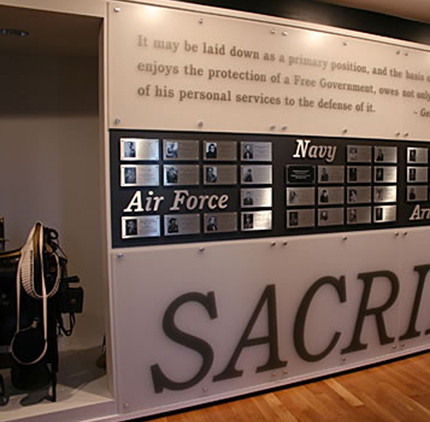 Langton Associates has also worked with The Heritage Foundation to coordinate and integrate the display components. Langton Associates designed this 4, 500 SF multi-building complex to serve the requirements of the Public Works Department. Critical areas of the site development included building locations to facilitate efficient site circulation on property within a flood plain. The main building included a five-bay garage, administrative offices, locker room and necessary support spaces. The annex structures included covered equipment storage and a salt storage facility. These structures were based on the Space Program Study performed by Langton Associates. The overall project budget was approximately $525,000.